"We are most nearly matched in humour, skill, looks, determination, dexterity, resourcefulness, and sensibility. These are far too many conflicting factors to ignore. I, therefore, propose that instead of being enemies, we should be friends. Good friends. In fact, I propose that I propose. Let's be wed. What do you say?" I'm going to miss you guys. I've only been in this thing for about three years now, originally introduced to it by my good chum, David. I can't say I regret any of the time I've spent on this website at all. It's been exciting, amazing, invigorating, and illuminating. All of you are awesome. Who, WHO could have predicted this ending? @Dschonn I considered a death, but McBurney already did that in Whiskerino. I needed something different. And the timing was just so right. @cdub for actual reals! 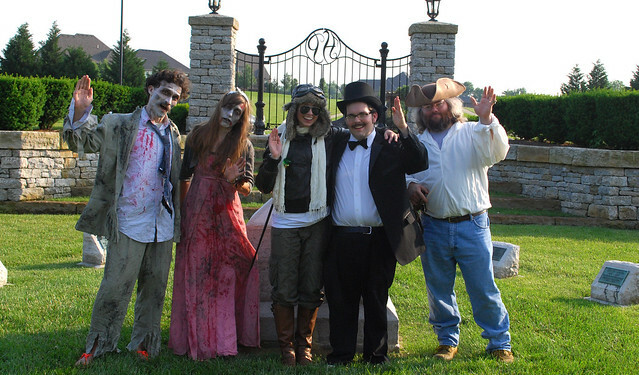 in a horse cemetary, surrounded by zombies and a pirate. normal for us really. Thank you sir, for being so entertaining. SO freakin' excited for you guys!!! WHOO HOOO! Riding off into the sunset on a dirigible no doubt! Great ending to the story! "in a horse cemetary, surrounded by zombies and a pirate. normal for us really. " Is destined for greatness. Congratulations you guys. This kills. It was a pleasure seeing this story go through and to be a part (in a manner of speaking) of this momentous occasion. So you're kids will only be half diabolical, I assume. Congrats, you two! So awesome man. Congrats to the both of you. great shots this month – and my favorite: a happy ending. thanks for letting me take part in the fun. But seriously, congratulations, you two! And big props to the level of picture dedication. Perftect ending to a perfect series. WHAAAAT! CONGRATS !!! That's the power of a Moustache right there. Fantastic meeting you Friday! Hope you had a good weekend camping! there were plenty of firsts for me in this scene...first engagement i witnessed with my own eyes...first engagement where I was dressed as a zombie...first engagement where i was dressed as a zombie and we were in a horse cemetery. you know. p.s. glad we were a part of this special day! love you guys! Freaking awesome! You guys rule! Congratulations! can i attend in full robot uniform? Actually, can i do your wedding? as the Moustache Mayor Robot? I saw this on LadyRaymerian page via her Twitter yesterday and it was tough to withhold my congrats. Possibly the best ending to a MM possible. This is great! Congratulations to a long future. The perfect ending. Thanks for keeping me glued to my screen! Wow! You weren't kidding when you said you have a great ending planned! This is fantastic! I congratulate you both on this monumental occasion. I wish you two all the happiness in the years to come. I have enjoyed our three "seasons" together and have cherished the many convos and comments with you. You are a great guy, whom I have had the pleasure of meeting and hope to come across again! @dok your lonley guy stache bash was one of my only collaborations, and since then I have followed your posts on here and your blogs.. CONGRATS on the engagement and Congrats on turning her to the dark side!!! Well done my friend! Good Journey! Whoa! What a way to plan the month. You have done a great job all month...I have enjoyed your work, and want to say congratulations to the both of you. This series has been really amazing. Great job and take care. AMAZING. congrats to you both. RT badbanana: It's awful that those other chipmunks force Alvin to wear an A on his sweater just because he's an adulterer. My name is Doctor Baron Neville Finklebottom von Crushtein. You may call me Dok.Crush. In my quest for villainy, I am assisted by the nefarious automaton, Mr.Head. I have recently acquired a fiance.